The 50th story in the franchise is a marathon, not a sprint, to the finish of the Patrick Troughton era. Mike, Mike, and Dave enlist in The War Games with some assistance from “The Ten Doctors” cartoonist, Rich Morris. As we say goodbye to The Second Doctor, we say “Howdy!” to the Time Lords and some other important elements that would shape the DWU for years to come. This week, Mike, Bobby, and special guest Dan Carroll get out the pointy stakes, crossbows, and Holy Water and head back to the Hellmouth for a look at phenomenal second season of Buffy the Vampire Slayer. We also catch up with freelance journalist, producer, and avid costumer Meredith Placko (aka Ana Aesthetic) just long enough to strap her to The Geek Seat. Meanwhile, Howdy Mike reports on the wicked cool show that was the Boston Comic Con and the Red Shirts review TrekTrax. All this, plus the usual Rants, Raves, and Shout Outs! Next week, the Earth Station One crew grabs some popcorn, sodas, and snacks as we head back to the theater for our annual Big Summer Movie Review. That’s right, we’re looking ahead at the upcoming releases and picking our favorites. It's gonna be one blockbuster of an episode!!! We would love to hear from you. What movies are you looking forward to this summer? What films will fly, which ones will bomb? Drop us a line at www.esopodcast.com, at the ESO Facebook Group, email us at esopodcast@gmail.com, or call us at 404-963-9057 with your comments. We might just read yours on the show. This week, Mike & Mike dust off the Delorean, Bobby warms up the Time Tunnel, Anthony Taylor powers up the Sphere, and award-winning artist Mark Maddox plots a slingshot trajectory around the sun as the ESO crew explores our favorite movies and TV shows dealing with time travel. And we attempt to do so without the assistance of a certain Gallifreyan Time Lord! Comic creator James Burns spends some time in The Geek Seat and friends of the station Theresa and Alan preview the upcoming TrekTrax and TimeGate conventions. All this, plus the usual Rants, Raves and Shout Outs! 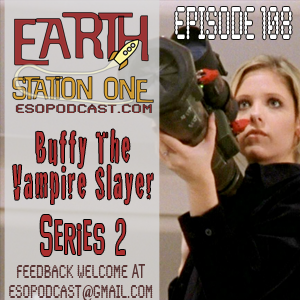 Next week, the Earth Station One crew packs up our pointy stakes, crossbows, and Holy Water as we head back to the Hellmouth for a look back at Buffy the Vampire Slayer Season 2. We want to hear from you! What are your favorite Sunnydale moments from season 2? Drop us a line at www.esopodcast.com, at the ESO Facebook Group, email us at esopodcast@gmail.com, or call us at 404-963-9057 with your comments. We might just read yours on the show. The Doctor is dead! Long live The Doctor! 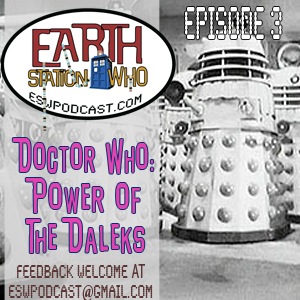 Patrick Troughton makes his debut as the mysterious Timelord and faces a familiar enemy in The Power of the Daleks. Mike, Mike, and Dave are once again joined by Articles of the Shadow Proclamation cohost, Scott Viguie, as they review one of the most essential storylines of the franchise – too bad no one can watch it! The April con tour comes to a close for me this weekend, and I can't think of a better place to be than at the Boston Comic Con! To be honest, I'm still recovering from C2E2, but I would not want to miss this show in my ol' home state! You can find me at Artist Alley table #505. I'm sad to say that I will not have the Invisible Scarlet O'Neil graphic novel (which is very nearly complete), but I will have copies of Tiki Zombie #1 as well as the Crypto Zo preview special. Plus, a few other surprises! Looking forward to a wicked good time!!! The New Legend World Tour continues! This weekend we'll be at C2E2 in Chicago, IL. We will be sharing booth 752 with our good friend Kyle Puttkammer, so in addition to Tiki Zombie, Crypto Zo, and Invisible Scarlet O'Neil books, you'll also be able to get issues of Galaxy Man! Come by our booth and say, "Howdy!" and we'll make sure you leave with something special! 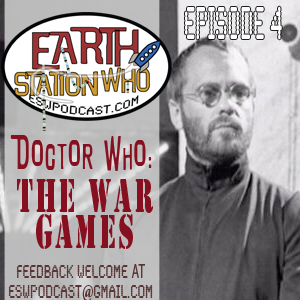 On this episode, the Earth Station One crew has finale fever! Mike, Mike, Bobby and special guest Victor dive into television history and discuss our favorite series ending episodes, those that left us flat and remember those shows that left us too soon. In addition, we strap writer Andi Judy in The Geek Seat and hear Khan reports from Emerald City Comic Con from Mandy Lee, Marcon from Howdy Mike, and Frolicon from the very naughty Bobby Nash. All this, plus the usual Rants, Raves, and Shout Outs! 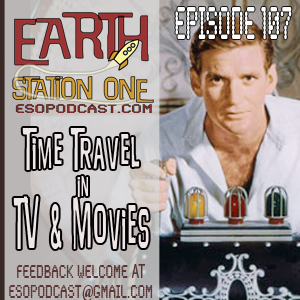 Next week, Earth Station One dust off the Delorean, warms up the Time Tunnel, powers up the Sphere, and plots a slingshot trajectory around the sun as we explore our favorite movies and TV shows dealing with time travel. And we attempt to do so without the assistance of a certain Gallifreyan Time Lord! We want to hear from you! What are your favorite time travel stories in any media? Drop us a line at www.esopodcast.com, at the ESO Facebook Group, email us at esopodcast@gmail.com, or call us at 404-963-9057 with your comments. We might just read yours on the show. I very much enjoyed my time at Marcon 47 this past weekend! 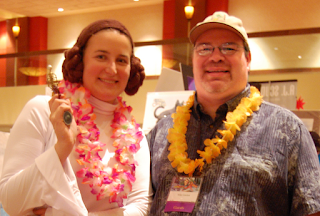 A big Mahalo to Sidley for the invitation, Jennifer for running a friendly con suite, the rest of the staff for their enthusiasm, the Hyatt Regency for their hospitality, my fellow guests for the camaraderie, the folks who attended my panels for the lively discussions, and the fans who came by our table! Columbus is a funky town and I look forward to coming back and exploring more of the city. Both William and I would love the opportunity to return! 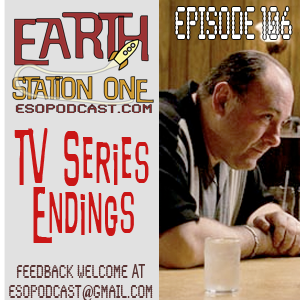 I've posted some pics here and will be reviewing the show on episode #106 of the Earth Station One podcast. 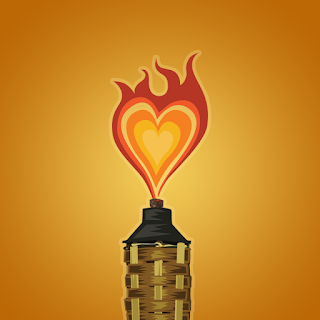 I am so looking forward to my first Marcon in Columbus, OH! I'll be bringing the tiki! SUN 10:00am Knox Comics-Why aren't you reading this? 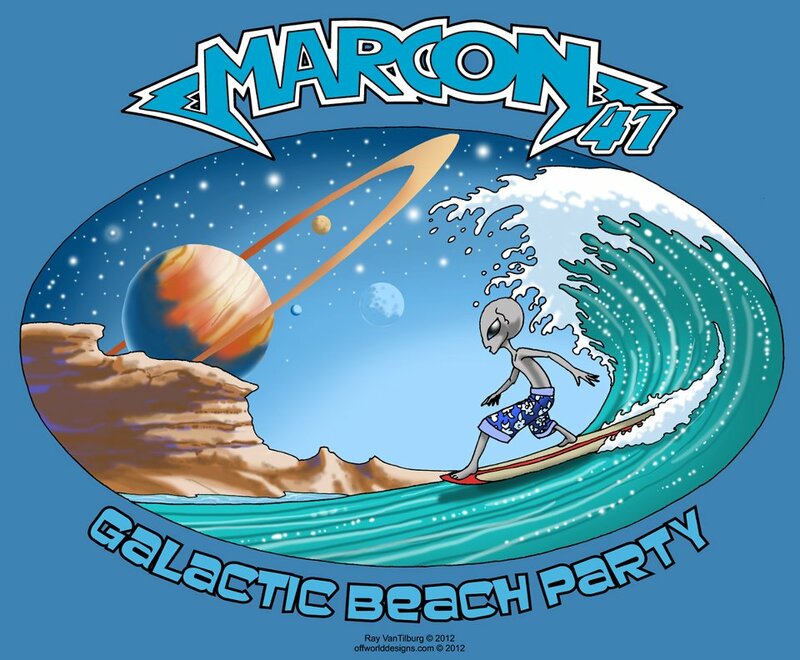 The theme for this year's show is "Galactic Beach Party" and we'll have our tiki table set up with plenty of copies of Tiki Zombie #1! We'll also have limited quantities of our new Crytpo Zo preview, so come and get 'em before they're gone! Plus, any purchases at our table get a FREE LEI!!! 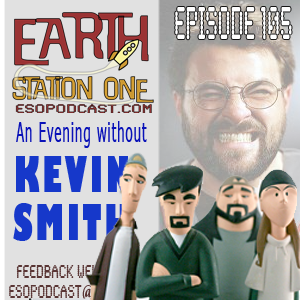 The ESO hangs out at the Quick Stop to discuss the works of Kevin Smith. We assure you, we’re open to review the good, the bad, and the dogma of Smith’s influential career. Mike, Mike and the Not-So-Silent Bobby are joined by Richard Ewell, who finds himself strapped to The Geek Seat. 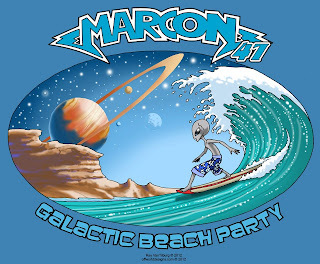 Also, Marcon’s Sidley Helphrey joins us for a preview of the upcoming Galactic Beach Party in Columbus, OH. All this plus the usual Rants, Raves, Shout Outs and Khan report. And I wasn’t even supposed to be here today! Next week, the Earth Station One crew has finale fever. That’s right, ESO dives into television history to discuss our favorite series ending episodes and those whose endings left us flat. Plus, I’m sure we’ll dig into a few shows that left us suddenly, unexpectedly, and probably too soon. We want to hear from you! What television series do you think got the best send off? The most disappointing? And what series was cancelled far too soon? Drop us a line at www.esopodcast.com, at the ESO Facebook Group, email us at esopodcast@gmail.com, or call us at 404-963-9057 with your comments. We might just read yours on the show.